This stainless steel bottle opener is wrapped in an elegant black faux leather material that personalizes to a stunning gold contrast. The magnetic back allows you to keep it handy, attached to the fridge when not in use so no more digging through "the drawer" to find it when it's needed. The budget friendly price point makes it a unique promotional item to get your business or organization's logo out there in the public eye, or a personalized gift that's both attractive and useful. 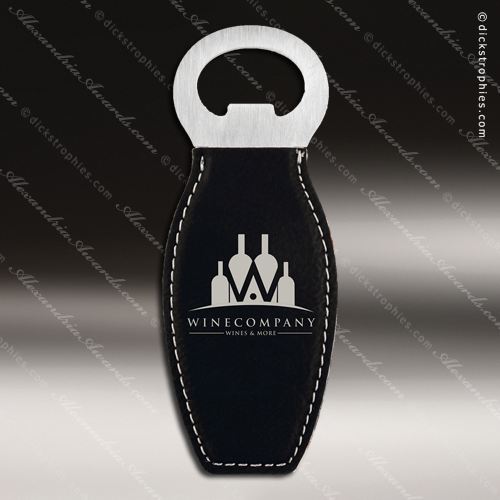 This stainless steel bottle opener is wrapped in an elegant black faux leather material that personalizes to a stunning silver contrast. The magnetic back allows you to keep it handy, attached to the fridge when not in use so no more digging through "the drawer" to find it when it's needed. The budget friendly price point makes it a unique promotional item to get your business or organization's logo out there in the public eye, or a personalized gift that's both attractive and useful. 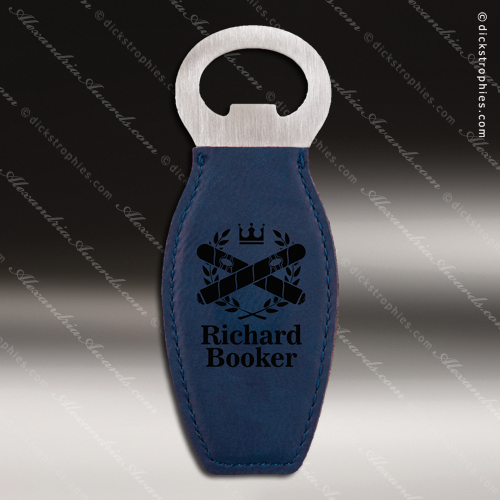 This stainless steel bottle opener is wrapped in a beautiful blue faux leather material that personalizes to an elegant black contrast. The magnetic back allows you to keep it handy, attached to the fridge when not in use so no more digging through "the drawer" to find it when it's needed. The budget friendly price point makes it a unique promotional item to get your business or organization's logo out there in the public eye, or a personalized gift that's both attractive and useful. This stainless steel bottle opener is wrapped in a beautiful dark brown faux leather material that personalizes to an elegant black contrast. 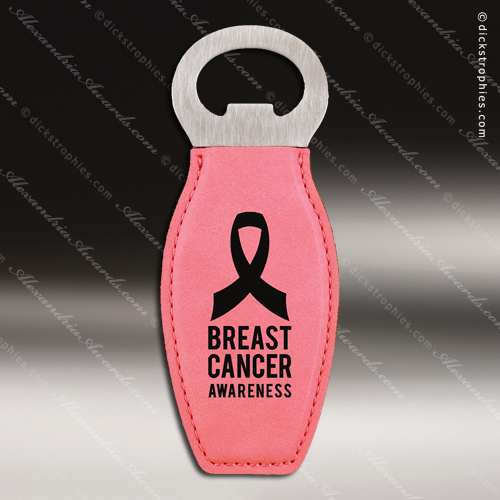 The magnetic back allows you to keep it handy, attached to the fridge when not in use so no more digging through "the drawer" to find it when it's needed. The budget friendly price point makes it a unique promotional item to get your business or organization's logo out there in the public eye, or a personalized gift that's both attractive and useful. This stainless steel bottle opener is wrapped in a beautiful rawhide faux leather material that personalizes to an elegant black contrast. The magnetic back allows you to keep it handy, attached to the fridge when not in use so no more digging through "the drawer" to find it when it's needed. The budget friendly price point makes it a unique promotional item to get your business or organization's logo out there in the public eye, or a personalized gift that's both attractive and useful.